To compare the corneal biomechanical properties before and after small incision lenticule extraction (SMILE) and femtosecond laser-assisted LASIK in different levels of myopia with the Ocular Response Analyzer (Reichert Ophthalmic Instruments, Depew, NY). A total of 187 and 79 eyes that received SMILE or LASIK, respectively, between January and June 2013 at Zhongshan Ophthalmic Center were enrolled in this study. Patients were grouped according to surgery type (SMILE or LASIK) and −6.00 diopters (D) or less (⩽ −6.00 D) or myopia greater than −6.00 D (>−6.00 D). Corneal hysteresis, corneal resistance factor, and 37 waveform parameters were recorded and compared preoperatively and at 1 week and 1 and 3 months postoperatively. There was a significant decrease of corneal hysteresis, corneal resistance factor, p1area, and p2area, and an increase of path1 and path2 in both SMILE and LASIK. In myopia −6.00 D or less, the differences between SMILE and LASIK were not significant (P > .05), but in myopia greater than −6.00 D, the corneal hysteresis, corneal resistance factor, p1area, and p2area decreased significantly more in LASIK than in SMILE (P < .05). When comparing SMILE with LASIK, myopia was greater than −6.00 D, and the corneal hysteresis, corneal resistance factor, p1area, and p2area decrease was less after SMILE. From State Key Laboratory of Ophthalmology, Zhongshan Ophthalmic Centre, Sun Yatsen University, Guangzhou, China (DW, ML, YC, XZ, C-HT, QL); the Department of Ophthalmology, Liu Zhou Worker’s Hospital, Liu Zhou, Guang Xi, China (YX); the Department of Ophthalmology, The Second Affiliated Hospital of Medical College of Xi’an Jiaotong University, Xi’an, Shan Xi, China (JW); and Laboratory of Experimental Optometry, Centre for Myopia Research, School of Optometry, The Hong Kong Polytechnic University, Hong Kong, China (C-HT, QL). The study was funded by National Natural Science Foundation of China (81110538), Science and Technology Program of Guangzhou, Guangzhou, China (12S202060079), the Henry G. Leong Endowed Professorship fund, and the PolyU research grant GUA32 for supporting analysis work in Hong Kong. The authors thank Drs. Ambrósio, and Roberts, and Mr. David A. Taylor for Ocular Response Analyzer parameters explanations. Small incision lenticule extraction (SMILE) is a new refractive surgery procedure that involves the use of a femtosecond laser to create an intrastromal lenticule, which is then removed in one piece through a small 2- to 3-mm incision, avoiding the need for photoablation by an excimer laser. Previous studies have proven its safety, efficacy, stability, and predictability to be as good as LASIK,1–3 and surgeons expect this new surgery to have beneficial biomechanical effects. Reinstein et al. used a mathematical model to predict the biomechanical properties after LASIK, photorefractive keratectomy, and SMILE, and showed that SMILE may protect and leave more stromal tensile strength than LASIK and photorefractive keratectomy theoretically.4 Additionally Knox et al. performed an in vitro experiment that showed vertical side cuts through corneal lamellae, rather than horizontal delamination incisions, contribute to the loss of structural integrity during flap creation, which supports the hypothesis that flapless SMILE may save more corneal biomechanical properties than LASIK.5 Recently, Agca et al. reported there were no significant differences in corneal hysteresis (CH) and corneal resistance factor (CRF) between SMILE and LASIK.6 The sample size in their study was not large (60 eyes of 30 patients) and patients with high myopia were not included, so it is necessary to confirm their results and investigate the differences, if any, between low and high levels of myopia. 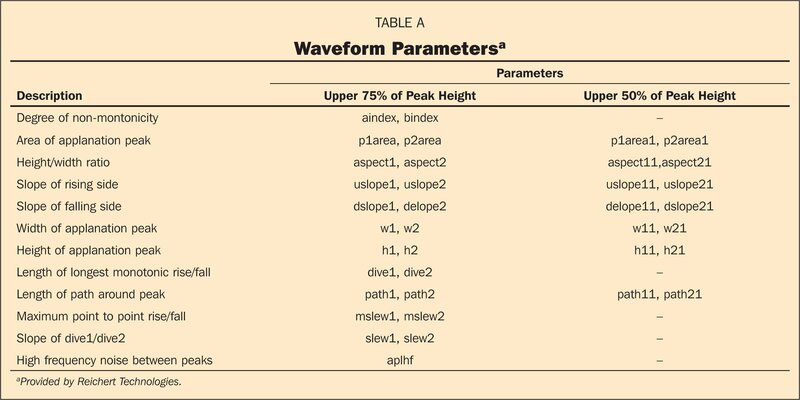 Explanation of waveform parameters. h1 and h2 represent the 75% height, p1area and p2area represent the 75% area under peak1 and peak2, respectively. dive1 and dive 2 are the longest monotonic distance from top to bottom on peak1 and peak2, respectively. p1 and p2 represent the air pulse force that causes the inward and outward applanation on cornea, respectively. path1 and path2 are stereo description of length around 75% of peak1 and peak2 respectively. The purpose our current study was to investigate the corneal biomechanical changes including CH, CRF, and new parameters after SMILE, and compare them with LASIK in different levels of myopia. This was a prospective observational study. Patients undergoing SMILE and LASIK between January and June 2013 at Zhongshan Ophthalmic Center were enrolled. Inclusion criteria were ages 18 years older, a willingness to discontinue use of glasses, normal topography, normal anterior segment by slit-lamp microscopy, and normal fundus by dilated funduscopy. Exclusion criteria were glaucoma, ocular hypertension and history of ocular disease, trauma or surgery, systemic disease, pregnancy, or systemic corticosteroids use. Soft contact lenses were removed at 2 weeks and hard contact lenses at least 3 weeks before preoperative measurements. Corneal biomechanical parameters were measured by the same experienced surgeon using ORA preoperatively and at 1 week and 1 and 3 months postoperatively. Four successful measurements were taken and the highest waveform score was taken into analysis (Waveform Score ≥ 3.5).16 ORA software (version 3.01; Reichert Ophthalmic Instruments) was used to analyze the waveform signal and obtain 37 new parameters. IOPcc was used in our current study as the description of IOP. All surgeries were performed by the same surgeon. For SMILE, the VisuMax femtosecond laser system (500 kHz; Carl Zeiss Meditec, Jena, Germany) was used. The femtosecond laser parameters were: 120-µm cap thickness, 7.3-mm cap diameter, 6.3-mm optical zone of lenticule, and the energy for cap and lenticule creation was 180 nJ. For LASIK, the VisuMax femtosecond laser system was used to create the flap and the Allegretto Wave excimer laser (400 Hz; Alcon Laboratories, Inc., Fort Worth, TX) was used to treat myopia and astigmatism. The treatment parameters were: 90- to 110-µm planned flap thickness, 7.5-mm flap diameter, 6.5-mm optical zone, and the femtosecond laser energy for flap creation was 130 nJ. The ablation depth was calculated by subtracting the postoperative central corneal thickness (CCT) from the preoperative CCT. The CCT was measured by the Pentacam (Oculus Optikgeräte GmbH, Wetzlar, Germany). Based on previous studies,17,18 the Pentacam is known to provide precise results of CCT19 and offer a better inter-observer reproducibility and inter-session repeatability when compared with ultrasonic pachymetry. Statistical analyses were performed using SPSS version 18.0 (SPSS, Inc., Chicago, IL). General linear model-repeated measures and multivariate analysis of variance (ANOVA) were used to compare biomechanical parameters preoperatively and postoperatively, and at different times between SMILE and LASIK. Fisher’s least significant difference test was used as the post-hoc analysis. Because most parameters did not follow normal distribution (Shapiro–Wilk test), non-parametric tests were used to compare baseline data between SMILE and LASIK. A P value less than .05 was considered statistically significant. A total of 187 eyes of 94 patients (48 male and 46 female) who underwent SMILE and 79 eyes of 40 patients (18 male and 22 female) who underwent LASIK were included in this observational study. The patient information and baseline data are shown in Table 1. There were no significant differences in the demographics between the groups (non-parametric test, P > .05), except for ablation depth and baseline dive2 in myopia of −6.00 D or less (non-parametric test, P < .05), so dive2 was not used to make comparisons between SMILE and LASIK. There was a significant decrease of CH, CRF, p1area, p2area, p1area1, p2area1, h1, h2, h11, h21, dive1, dive2, dive11, and dive21, and a significant increase of path1, path2, path11, and path21 during both LASIK and SMILE and in both low and high myopic groups (general linear model-repeated measures, P < .05) (Figure 2). Other waveform parameters showed relatively irregular changes. Because data1 (eg, h1) explains 75% of the peak, whereas data11 (eg, h11) explains 50% of the peak, only 75% peak data for analysis was used. The decrease of the p1area, p2area, h1, h2, dive1, and dive2, and increase of path1 and path2 suggested a lower, duller, and rougher waveform postoperatively compared with a higher, sharper, and smoother waveform preoperatively. Although “h” describes the height of the peaks and “dive” describes the length of longest monotonic rise or fall, both h and dive showed a high intercorrelation to the p area (ie, the area under the peak) (Figure 1).20 In addition, the changes of h1 and dive1 have a linear correlation with changes of the p1area (r = 0.685, 0.378, respectively, Pearson’s bivariate correlation test, P < .001). 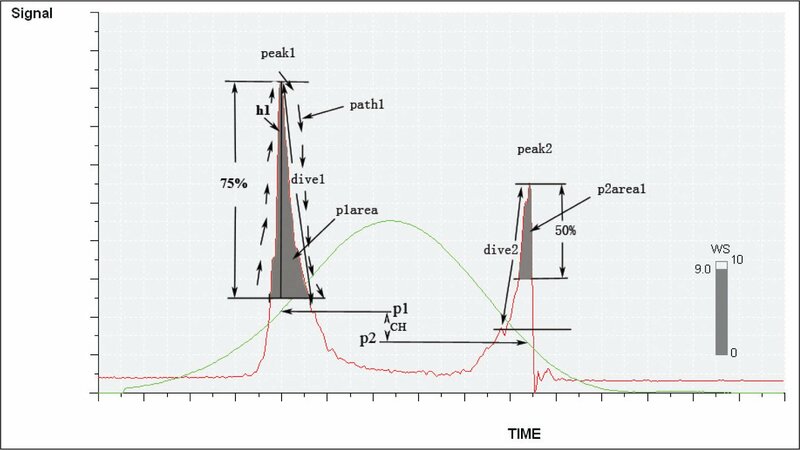 Changes of h2 and dive2 have a linear correlation with changes of the p2area (r = 0.671, 0.594, respectively, Pearson’s bivariate correlation test, P < .001), so only the p1area and p2area were considered for the analysis. “Path” was a stereo description of the peak length, so path1 and path2 were also used in analysis. The parameters showed similar changes between and small incision lenticule extraction (SMILE) in myopia of −6.00 diopters (D) or less. In myopia greater than −6.00 D, the corneal hysteresis (CH), corneal resistance factor (CRF), p1area, and p2area decrease more in LASIK. MRSE = manifest spherical refractive equivalent; *= multivariate analysis of variance, P < .05. 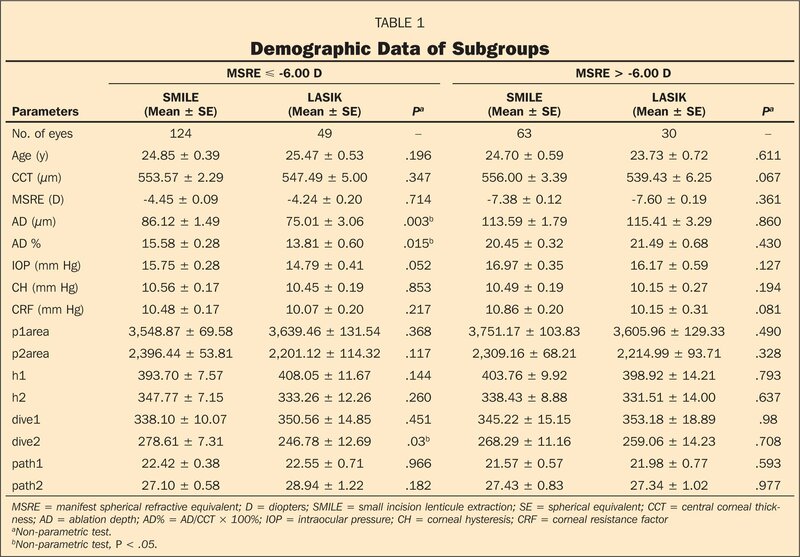 When we compared parameters in the different subgroups, results showed that between the low myopia SMILE and LASIK groups, the differences of CH, CRF, p1area, p2area, path1, and path2 were not significant (multivariate ANOVA, P > .05), but between the high myopia SMILE and the LASIK groups, the CH, CRF, p1area, and p2area decrease was significantly greater in the LASIK groups (multivariate ANOVA, P < .05) (Figure 2). The change of path1 and path2 also showed no significant differences (multivariate ANOVA, P > .05). Vinciguerra et al. investigated the ORA parameters after corneal cross-linking surgery and concluded that the keratoconic cornea becomes steeper and the area applanated by ORA becomes small,24 but refractive surgery results in a decrease in apical power that may cause an increased applanation area theoretically. Therefore, we suspect the lower wave may be due to asymmetric corneal deformation and unevenness of the corneal surface. In refractive surgery, it is impossible to make an absolute uniform ablation, especially in LASIK, using excimer laser (femtosecond laser uses a curved interface cone with suction to fix the eye positions, whereas excimer laser uses infrared tracking that permits more eye movements during the laser procedure), and healing under the flap or the cap is not as strong as stroma without surgery, which may result in an asymmetric deformation and recovery process under the rapid air puff of ORA and explain the lower, duller, and rougher wave pattern postoperatively. On the other hand, corneal surface and tear-film changes after refractive surgery may also contribute to the waveform changes. Many studies found a worsened decrease of corneal sensitivity and tear film break-up time after LASIK than SMILE due to the impairment of the subbasal nerve plexus.25–27 It was also observed that patients with SMILE were less likely to have corneal staining compared to those with LASIK.26 Although most studies showed that tear film break-up time and cornea staining can recover and become normal after 3 months postoperatively, a study using the Keratograph (Oculus Optikgeräte GmbH), which is an objective measurement of tear film break-up time, showed that after 6 months postoperatively, the first break-up time of tear film was 4.4 ± 2.6 seconds in femtosecond lenticule extraction, which is similar to LASIK but uses a femtosecond laser instead of an excimer laser for refractive ablation, and 5.6 ± 4.9 seconds in SMILE.28 Therefore, these corneal surface changes may cause a less smooth reflect plane for ORA measurement and partly explain the changes of ORA waveform and the different waveform changes between SMILE and LASIK. Some waveform parameters in our study showed large variations and their changes seem disorderly (eg, uslope, dslope, mslew, and slew). Future studies should focus on the repeatability and reproducibility of these new parameters and their correlation with corneal biomechanical properties. 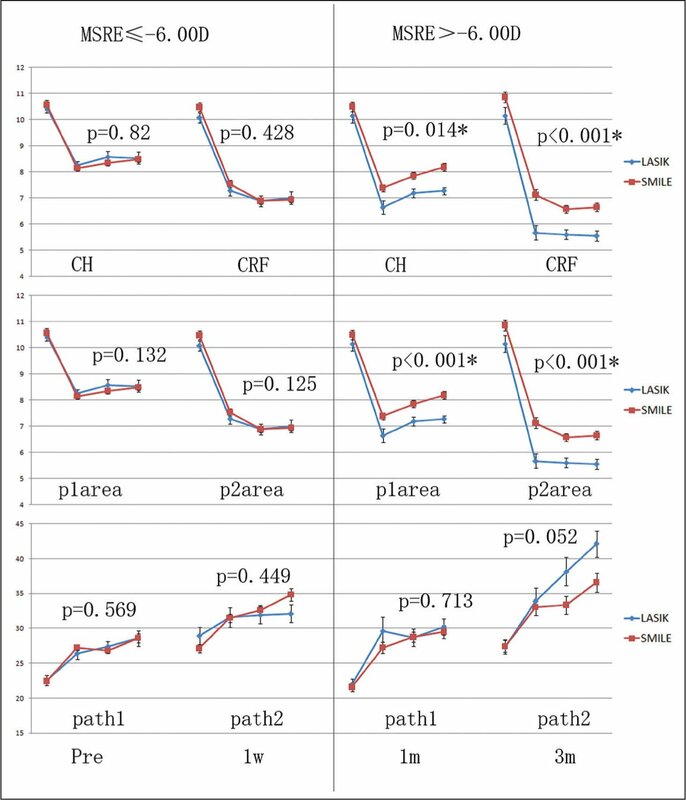 An interesting phenomenon is that in myopia of −6.00 D or less, the differences of the CH, CRF, p1area, and p2area (Figure 2) between SMILE and LASIK were not significant (P > .05), which is consistent with the study by Agca et al.6 But in myopia greater than −6.00 D, the CH, CRF, p1area, and p2area decreased more in LASIK (P < .05). This suggests that SMILE may benefit more in corneal biomechanical properties in myopia of greater than −6.00 D. The reason why this happened has not been reported in previous studies, but we speculate that in myopia of −6.00 D or less, SMILE ablates more cornea than LASIK (Table 1) and this may be responsible for part of this phenomenon. In myopia greater than −6.00 D, SMILE saves more of the stronger anterior lamellae (SMILE has a constant cap thickness of 120 µm, but in high myopia, LASIK always guarantees a safe thickness of the corneal stromal bed by thinning the flap to approximately 90 to 100 µm) and SMILE flapless technology protects the anterior lamellae integrity. Until now, the manufacturer of the VisuMax femtosecond laser system limited the highest surgery MSRE to −10.00 D, but it is possible that this limit will be revised in the future so that we can ascertain if SMILE can be a safer way for treating myopia of greater than −10.00 D. We also expect that SMILE will offer thinner lenticule in myopia of less than −6.00 D because this may help save more corneal biomechanical properties. The disadvantage of this study may be that the follow-up time of 3 months was not long enough to see the recovery of these parameters and observe the keratectasia or regression of these patients. Long-term follow-up is needed to evaluate the correlation between corneal biomechanical properties and refractive surgery outcomes. When compared with the LASIK group, the CH, CRF, p1area, and p2area decreased less in SMILE in myopia greater than −6.00 D.
Luce D. Methodology for cornea compensated IOP and corneal resistance factor for the Reichert Ocular Response Analyzer. Invest Ophthalmol Vis Sci. 2006;47:2266. Luce D, Taylor D. Reichert Ocular Response Analyzer measures corneal biomechanical properties and IOP. Reichert Ophthalmic Instruments. 2006. Fry KL, Luce D, Hersh PS. Integrated ocular response analyzer waveform score as a biomechanical index of keratoconus disease severity. Presented at Association for Research and Vision in Ophthalmology. ; April 27–May 1, 2008. ; Ft Lauderdale, FL. .